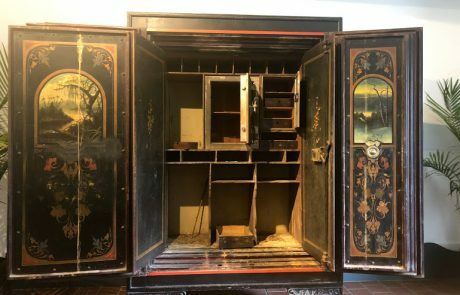 You might have seen the Lightner Museum’s vault by the Granada entrance of the Cafe Alcazar and wondered what was inside. To tell the truth, we also wondered. 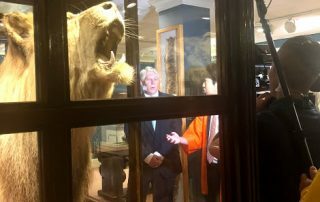 No one that is currently working at the museum has unlocked it or has ever seen it unlocked. 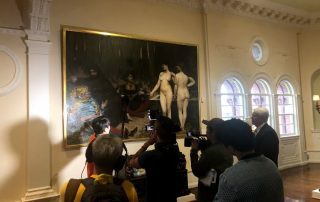 We believe that Otto Lightner may have had the combination, but Otto Lightner died two years after the museum was established. There was the possibility that the vault was last opened when the Hotel Alcazar was preparing to go out of business. The combination was reportedly in the Director’s office, but it was not to be found. 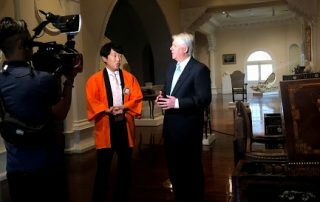 A Japanese TV show researched vaults in the United States by reading articles and social media posts when they discovered the Lightner Museum safe. They decided to contact us to attempt to crack it. 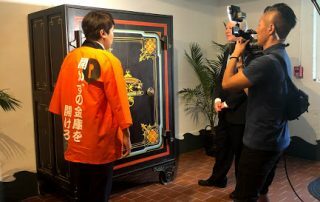 The show, titled “Tokoro-san no Gakko dewa oshiete kurenai Sokontokoro,” is about opening safes that haven’t been open in decades or are difficult to open due to different factors. 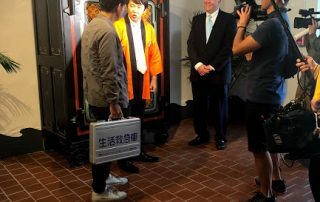 We invited Host Takatoshi Kaneko, safe expert Kyoichi Tamaki, and their cast and crew to open the safe so we could see what was inside. 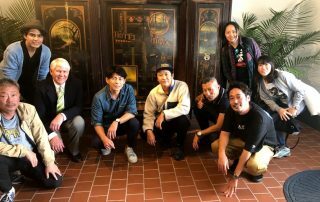 This was not only Kyoichi Tamaki’s first time attempting to open a safe in the United States, but also his first time in the country. 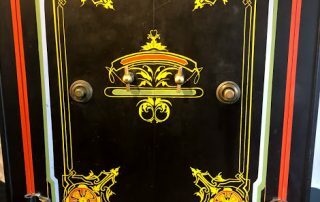 The safe has a patent with a date of September 7th, 1890 and was made by the Marvin Safe Company. The front of the safe had two doors with what seemed like two separate combination locks, however, only one was the right one. The other has a mechanism that, in theory would open the left side door once the right door was opened. 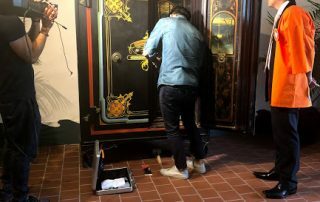 According to museum curator Barry Myers, it was typical of safes from this time to have paintings of woodland scenes. These would have been painted by artists who were just starting out and became successful later on. We believed the safe would have been in the hotel check in. Its purpose would have been to hold previous jewelry or items that guests wanted to safe keep. Previously, the check in was inside the main part of the lobby and the side courtyard was a sunken courtyard but was then covered and converted to a wing of the lobby in 1892.The wing was taken out in the 1970s and it is now one of the museum’s courtyards. 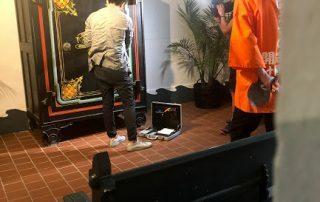 During Hurricane Irma, water entered the historic pool area and the safe had water up to its wheels. The surface of the vault has been restored since the building became the Lightner Museum. 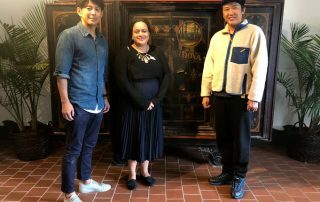 Tamaki spent two days working on opening the safe and filming. After a full day of hard work, the first door was open. However, the mechanism to unlock the second door failed, resulting in the need to use some force. 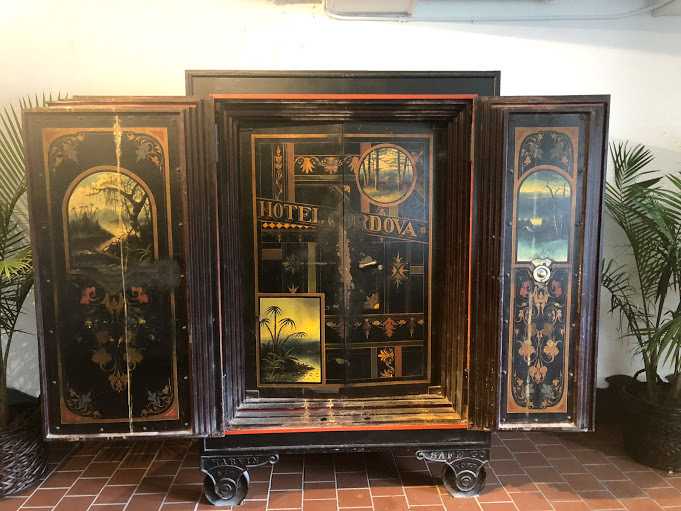 Once the main doors were opened, the truth was revealed- The safe was not from the Hotel Alcazar but from the Hotel Cordova, presently the Casa Monica hotel. The Casa Monica was built by Franklin Smith, but Henry Flagler purchased it from Smith soon after it opened and renamed it the Hotel Cordova. the Hotel became the “Alcazar Annex” and had a bridge linking the two hotels. It officially closed in the early 1930s. 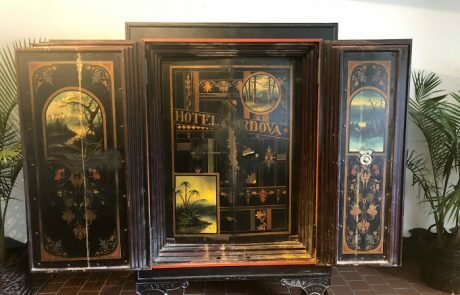 There is a possibility than when it closed, all of the furniture was moved over to the Hotel Alcazar or the Ponce de Leon Hotel, which did not close until 1967. The Ponce de Leon Hotel became Flagler College and it is believed that the college has two similar cases, one that could be the Hotel Alcazar’s. As expected, the inside was adorned with beautifully done woodland paintings and paintings of Florida’s main two environments: swampland and palm trees. 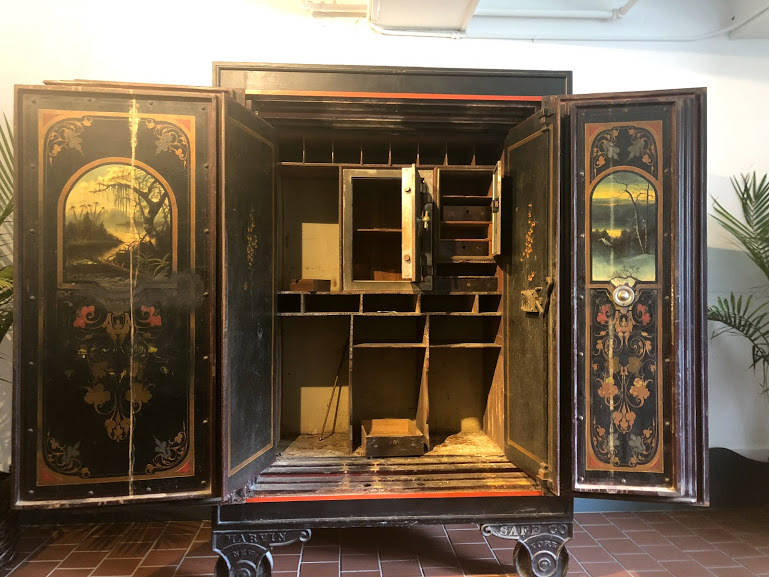 Once the second set of doors were opened, we were able to see that there were different compartments and safes inside. 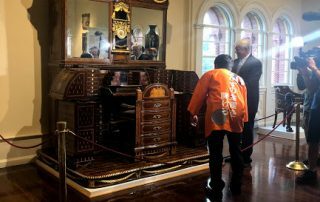 Swelling of the wood made it nearly impossible to open some of the drawers, however, Tamaki was able to use a small camera connected to his laptop to look into it. Inside was a label that had the safe’s instructions and, of all things, the combination. 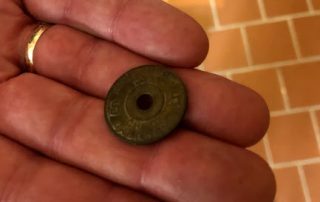 There were only a few other things that were found inside. 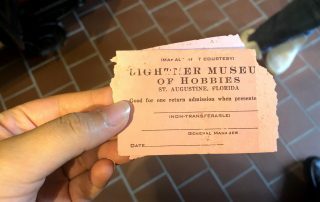 There were small things such a transportation token and paper clips, but there were also two interesting discoveries; inside there was a receipt for a correspondence from former Hotel Alcazar manager W. H. Beardsley and a couple of tickets to the Lightner Museum. 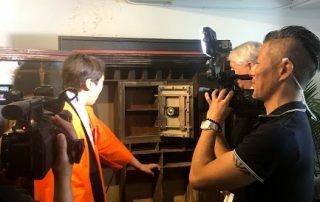 The finding of the museum tickets proves that the safe has been opened since the opening, meaning we still do not know who was the last to open it. The piece on display, and its safe to say it’ll be kept open. 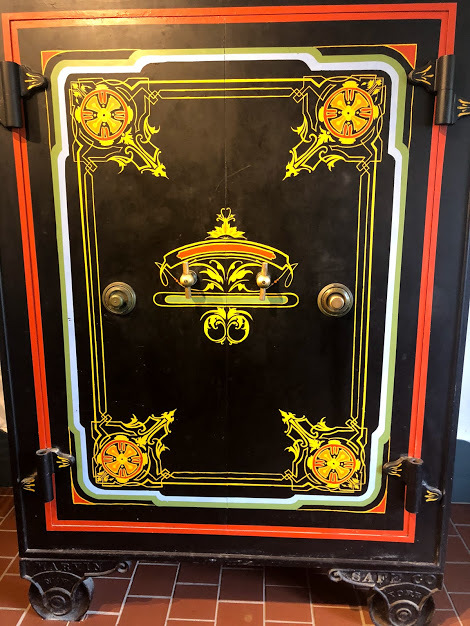 The museum has plans to restore the safe. You can see it by entering the Granada entrance to the Cafe Alcazar. The St. Augustine Record visited during filming and wrote an article that you can read here.